We live in a world where some things are simply expected to be free - particularly art and those types of art that are available digitally/online. We expect free television, music, images and visual art as well. But for all this "free", what's the cost? It's an interesting and perplexing question because there is a very real cost to this new economy, but it's convoluted. For instance, it used to be that musicians would essentially make their money directly from their fans. When I was a kid, you liked a band, so you paid $20-$25 for their CD. You probably also spent $50-$75 to go see them in concert and when you were there, you bought a $20 T-shirt. The artist would get a cut of each of those sales and that would be it - fan pays artist. Obviously, there were labels and other third parties involved as well, but for the most part, the money changed hands pretty logically. Today, however, large portions of artist’s income are derived from places like YouTube and advertising. So at the end of the day, what's happened is that money changes hands differently today than it ever did before. Today, artists don't sell albums as much and they give a lot of their art away. For instance, I can go on YouTube right now and search for Chris Tomlin's latest hit, Whom Shall I Fear, and listen to it over and over again - ostensibly without paying a single penny. So how does Chris get paid? Well, in part, it's through advertisements. The ads placed by companies like Coke and even non-profits like World Vision will pay Chris - and we'll just keep watching for free…or so we think. The reality though, is that in order for Coke and World Vision to keep up with the growing advertising options and the need to pay artists salaries (the amount they get paid is not the point here), they will need to sell more product (or increase their prices) and gain more donations respectively. So at the end of the day, the money will still come out of our pockets. It will just take a far more circuitous route to get to the artist. This will also mean that advertising budgets of organizations across the world will continue to grow and perhaps even soar in the years to come. The challenge for us as an ad agency working in this new economy is that connection isn't easy to see and people will have a hard time understanding why advertising budgets are going up and in turn, the cost of "stuff" is going up. Furthermore, in all this devaluation of creative art, advertising as an art form is being devalued as well. It's an art form to come up with a creative concept. It's an art form to design an effective ad, website or mobile app. Programming is also equal parts technical skill and art. And along with our music, movies and television, in the minds of many, advertising should be cheap too - if not free. And the consumer? Well, we may think we're getting some stuff for free, but we're giving away a lot more than just dollars and cents, we're giving away ourselves. We're allowing our preferences to be saved up in databases all over the place, to the degree that our personalities, likes and dislikes can be predicted and our online experiences massaged to fit our specific tastes. If you don't believe me, go and pick a movie on Netflix that you wouldn't normally pick, watch 10 minutes and then go back to your library and see all the new movies that show up. Your profile changed based on the selection you made. As long as you stay within that profile, your movie options will stay the same. If you change, so will they and each time you make a new selection, the more detailed and accurate is the picture of you as a person in that database. This new economy is unknown territory and it comes with many different risks. Realize that there are costs to the "free" stuff you're getting. Some way, some how, artists will be paid and the money will come from you eventually. Part of the new economy is a new currency - you. 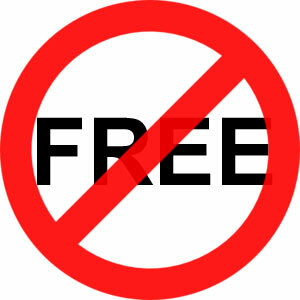 Stop devaluing advertising because it pays for your "free" stuff. Don't be surprised when the costs of goods and services go up because organization's advertising budgets have ballooned. Expect to grow your ad budgets, because the options are vast and artists need to get paid.